"In the early morning Breakfast box will be ready for you, leaving the cruise for 04:00 a.m. convoy to Abu Simbel to see these marvelous temples, which were originally carved out of a rocky mountainside by Ramses II (the trip takes around 3hrs 30min driving) After the trip drive back to Aswan for lunch on board as the boat sails"
It was sunny and cold as we crossed the narrow gangway connecting the Amoura to the shore, traversed a pasture to the road, and found the waiting van and driver. One stop for gas and coffee - otherwise we saw a lot of desert on the long drive. Ismail didn't like the cold. "Raising the huge sum needed to move these temples took so long that they were the last of the threatened monuments above the High Dam to be moved. The project became a neck-and-neck race against a man made deluge. The first step in the salvage plan, conceived by the Swedish consulting engineering firm of VBB was to move hundreds of thousands of tons of rock surrounding the temples; the two monuments would then be cut into 1,050 pieces of as much as 33 tons each. These would later be reassembled 690 feet from the old shoreline, above the highest level of the reservoir. 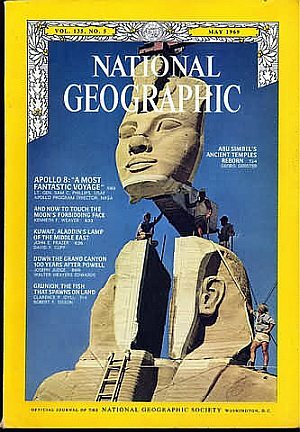 By May 1966 engineers had dug away 330,000 tons of cliffs and had removed the sanctuaries, leaving gaping holes.... Once again commanding the desolate Nubian frontier, Abu Simbel’s relocated temples stand more than two hundred feet higher and 690 feet inland from the former shore." It only took me 48 years to get here and see it for myself. The queen is pictured here as well as some large statues behind her. By the time we returned to the dahabiya, our fellow passengers on the Amoura had departed. It would just be Sigrid, me and Ismail on board for the remaining cruise back downstream. The captain knew I was interested in fishing, loaned me his rod & reel and provided chicken skin for bait. I also had my travel rod & reel so could get two lines in the water. That night I bundled a bread and chicken skin gob around a hook and threw the mess over our aft balcony before going to bed, thinking I might pull a Nile catfish off the bottom.